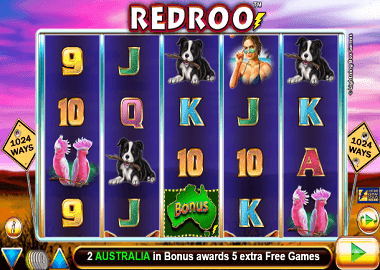 The Redroo Slot of Lightning Box Games is a beautiful video slot with the theme of Australia or “Down Under”. The Redroo slot is one of the “Ways to Win” slots. Lightning Box Games chose the 1024 ways to win version. In this 5 reel, 4 symbols slot, the same symbols need only land side by side on the reels. Not infrequently you win with multiple winning ways with a single spin. You have to bet at least £0.40 per spin. In addition to the interesting base game and the multiple winning opportunities, the Reedroo slot also has a free spins feature. Symbols and payouts: The symbols are suitable for Australia a surfer, a pretty bathing mermaid, a dog, a parrot and card symbols from 9 to ace. Last mentioned symbols are the low paying symbols. The ace and king symbol has the biggest win here with 140x your bet. The dog and the parrot pay 150x your bet and the two beach beauties 200x your bet. Another symbol is the redroo symbols. It is the most valuable symbols and if you get 1 Redroo symbol on your reels your bet will be multiplied by 250. Wild and Scatter: The Red Wild Rock icon is your wild symbol and a key symbol especially in the free spins feature of the Redroo Slot. This symbol appears only on reels 2, 3 and 4. The wild rock symbol substitutes all symboles except the Australia symbol. This symbol is logically your scatter symbol. But in the free spins feature, there’s a special surprise awaiting you. Free Spins Feature: Not only that you get up to 20 free spins with at least three Australia Scatters, but also an instant win. With 3 Australia symbols 80x your bet, with 4 Australia symbols 400x and with 5 even 800x your bet. So even if you only play with £ 0.40, you already get £ 32 profit. In the free spins you can also get the Wild Rock symbol again. This time you will get up to 27x multipliers on your winnings! Two Australia symbols in the free spins extend the feature by 5 free spins each. We offer more Lightning Box Games for free to play. You can start the Redroo Slot by clicking on the top of the slot. Other popular Lightning Box games are the Blazing Goodess slot or the Chilly Gold slot. There are a number of recommended online casinos with slots by the Australian software company. For example, at O’Reels Casino you can play 100 bonus spins after registering. More online casino and bonuses can be found below.